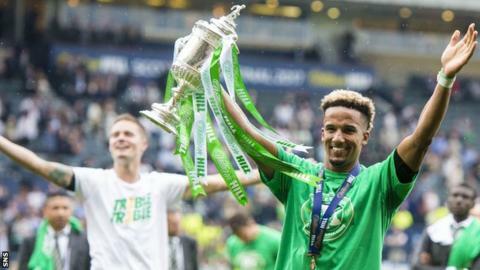 Winger Scott Sinclair believes Celtic can repeat their unbeaten domestic season. Brendan Rodgers' side won the treble in 2016-17 and dropped only eight points in the Premiership. "I'd like to think so," said Sinclair, 28, on the prospect of repeating the unprecedented feat. "I think everyone will try to beat us. Because we went unbeaten last year, everyone will be coming out the blocks and ready to stop our unbeaten run." Jonny Hayes joined Celtic on a three-year deal on Saturday, after a five-year spell at Aberdeen, while fellow winger Patrick Roberts has returned to parent club Manchester City after 18 months on loan at Celtic. "I think we're much stronger," said Sinclair, looking ahead to the next campaign. "Last season, game by game we improved dramatically from the start to finish. "We started off very well and we finished off even stronger. "I'm sure [last season's runners-up in all competitions] Aberdeen will be up there and I'm sure every team will be trying to win." Rodgers' players are back in training with Champions League qualifiers on the horizon, having reached the group stage last term. Celtic, who will be away from home in the first leg, will face either Northern Ireland's Linfield or San Marino's SP La Fiorita in the second qualifying round, with ties to be played on 11 or 12 July and 18 or 19 July. "No-one really sort of talked about it, to be honest," Sinclair said of the draw. "Every team, they're always out to beat us. No matter who we play, it's going to be a difficult game so we just have to keep the mentality, the character and not underestimate any team going into it. "To all the fans, they would love to see us in Europe again and playing on the Wednesday and Tuesday nights. "The main thing is to get into the group stages. Once we do that, then we can talk about how far we want to take it. "The season we had, we want to go through to the group stages and we want to progress from there. That's what we head towards and that's what we need to achieve."